So for today's P20P update I’ve done quite well, I’ve managed to finish 4 products. Seriously beauty, you need to do some catching up! I don't wear that much make-up, just eyes and lips so that's why I've added perfume to the mix so hopefully it won't take me years to finish P20P. Alva bath salts - You can read my review for these that I wrote the other month. I still love them and will be buying another soon. I don't have any other bath salts so I'm allowing myself to buy another bag. Hopefully the large bag will be in stock when I make my order! 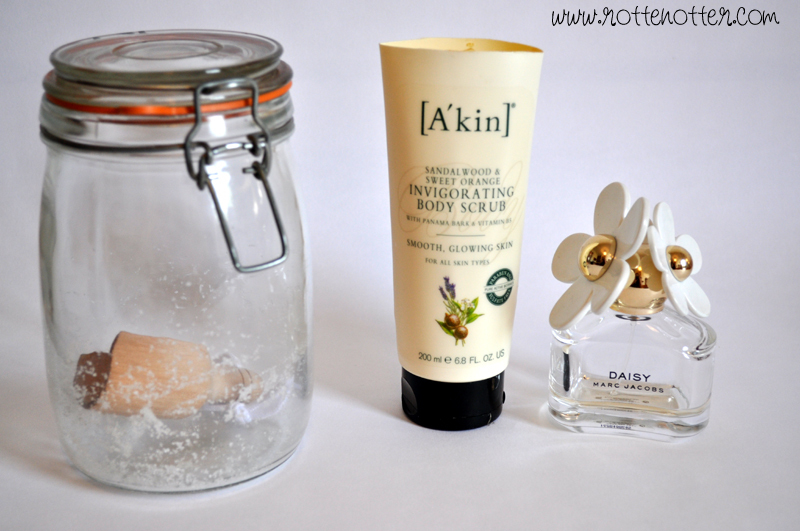 A'Kin body scrub – One of my favourite body scrubs along with Haus of Gloi. I used to love Soap and Glorys, the pink one, but I actually hate it now I've tried others. This leaves no oily residue, isn't harsh on the skin and lasts a really long time. I even cut the top of so I'd get every last bit. Definitely going to buy this once P20P is over. You can read my full review here. Marc Jacobs Daisy perfume - I love this and it has to be my favourite perfume so far. I amazingly won this 50ml bottle by signing up to the Daisy website after umming and aahing for ages if I should buy it. Despite loving it so much I've used it sparingly as I never wanted it to run out. It's the perfect spring/summer scent and I'm definitely going to be buying another bottle. I really want to buy Lola too. You can see the rest of my perfume collection here which is actually a lot smaller now. I’ve finished a fair few and have given some away too. I haven’t got a photo as there isn’t anything left but I’ve finished all the bubble bars and bath bombs from my last Lush order. I’m counting these as one as Lush items always seem a bit of a cop out for P20P’s as you use them so quickly. You can see what I bought here. I’m going to a shopping evening in the Health Place where I work and Lush is going to be there handing out goodie bags. I’ll have to try my hardest not to buy anything!